Even in the 19th century in South-West Germany there were three large emigration waves. The poor harvests of the 1816/17 years led to the 1st big emigration wave. In South Germany many emigrant embarked on the Danube and settled in southern Russia (Bessarabia, Odessa area, around Tbilisi in the Caucasus). A smaller part of emigrants immigrated to the United States. 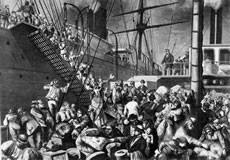 The continuing economic crisis of 1845 - 1855 sparked the 2nd and the largest mass emigration of the 19th century. It was almost exclusively in the United States. There were the original inhabitants, the Indians fought and distributed. Reports of gold discoveries in California suggested that emigration wave. After 1880, there was the 3rd emigration wave to the United States, but not the extent of the recent wave of emigration.